ST GEORGE’S - Dr Keith Mitchell, prime minister of Grenada and current chairman of the Caribbean Community (CARICOM), convened a special emergency meeting of heads of government of CARICOM on Tuesday by video conference, to discuss matters relating to the ongoing situation in Venezuela. Varied and robust views expressed during the three-hour meeting centered on promoting dialogue among stakeholders within Venezuela geared towards resolution of the political and social challenges in that country. Meanwhile, concerned that recent developments in Venezuela could lead to further escalation of tensions and hamper a peaceful solution to the crisis, United Nations Secretary-General António Guterres again urged the government and the opposition to re-launch negotiations for the benefit of the Venezuelan people. A statement from Guterres' spokesman said the UN chief is closely following events in the country and is convinced the crisis cannot be solved through the imposition of unilateral measures, but requires a political solution based on dialogue and compromise. 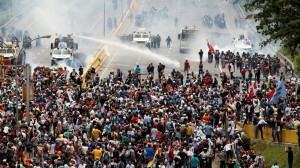 The Secretary-General and other top UN officials have been calling for calm amid the escalating political and economic crisis in Venezuela when mass street demonstrations began in the country in April. In the months that followed, clashes erupted between security forces and protestors opposing elections for the so-called Constituent Assembly. According to media reports, President Nicolás Maduro has since declared victory in elections for a Constituent Assembly convened by him. The new body could replace the current legislative body, the National Assembly. The UN High Commissioner for Human Rights, Zeid Ra'ad Al Hussein, also warned that since the wave of demonstrations began in April, there has been a clear pattern of excessive force used against protesters. “Several thousand people have been arbitrarily detained, many reportedly subjected to ill-treatment and even torture, while several hundred have been brought before military rather than civilian courts. And these patterns show no signs of abating,” said the high commissioner in a statement from his spokesperson. In the absence of responses from the Venezuelan authorities to requests for access, the High Commissioner deployed a team of human rights officers to conduct remote monitoring of the situation in the country from 6 June to 31 July, including from Panama. Witnesses told of security forces firing tear gas canisters at short range; buckshot marbles and nuts and bolts were also discharged as ammunition at anti-government protestors without warning; and deadly force was used against demonstrators as well. The team's findings also indicate patterns of other rights violations, including violent house raids, torture and ill-treatment of detainees in connection with protests. Witness accounts suggest that the National Guard, National Police and local police forces have systematically used disproportionate force to instil fear, crush dissent and prevent demonstrators from assembling with rare condemnation from government authorities. Without official data, estimates suggest that more than 5,051 people have been arbitrarily detained between 1 April and 31 July, when mass demonstrations, began with some 1,000 reportedly still detained. Several cases reviewed by the UN rights office revealed credible reports of cruel, inhuman or degrading treatment by security forces of detainees, some amounting to torture. Tactics included electric shocks, long periods of suspending detainees by their wrists, suffocation with gas and threats of killings. There were also sexual violence threats against detainees or their families.